Dan Kiley (1912-2004), the great Postwar landscape architect and icon of Modernism, remains a decade after his death one of the profession's most influential practitioners. 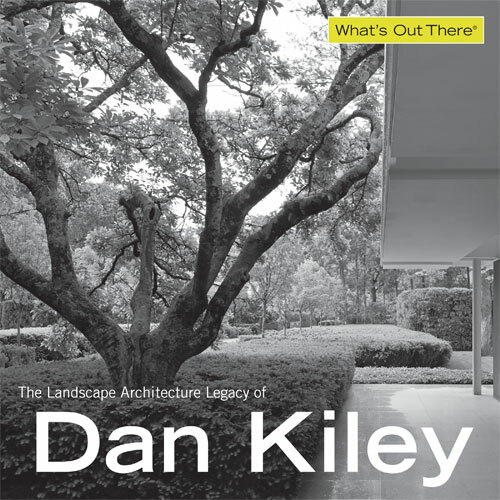 He's finally gaining greater public recognition, to judge from the popularity and demand for The Landscape Architecture Legacy of Dan Kiley, a traveling photographic exhibition organized by The Cultural Landscape Foundation (it's booked into 2017 and next opens at the Pittsburgh Cultural Trust on October 31, 2014). And, critical appraisal has advanced thanks in part to the Indianapolis Museum of Art, which now owns Kiley's residential masterpiece, the Miller House and Garden in Columbus, Indiana, created in the 1950s with Eero Saarinen, Kevin Roche and Alexander Girard. The museum is a leader in providing curatorial oversight for the landscape on par with the building and the rest of its collection -- an approach that I have advocated frequently over the years. Photograph © Millicent Harvey, courtesy The Cultural Landscape Foundation. Despite all this new visibility for Kiley, there is much still not known and awaiting discovery, and part of that involves retracing his steps. One of the most consequential periods in his life was immediately after World War II when Kiley went to Germany to be the architect for the Nuremburg trials courtroom. He took this opportunity to travel around Western Europe where he got his first exposure to what he called "formal, spatial built landscapes." "THIS is what I had been searching for -- a language with which to vocalize the dynamic hand of human order on the land -- a way to reveal nature's power and create spaces of structural integrity. I suddenly saw that lines, allées and orchards/bosquets of trees, tapis verts and clipped hedges, canals, pools and fountains could be tools to build landscapes of clarity and infinity, just like a walk in the woods. I did not see then, and to this day do not see, a problem of using classic elements in modern compositions, for this is not about style or decoration but about articulation of space. The thing that is modern is space." (Kiley, Dan and Jane Amidon, Dan Kiley: The Complete Works of America's Master Landscape Architect, Bullfinch, 1999). One of the great stumbling blocks in deciphering Kiley is that, as Marc Treib and Rueben Rainey noted in their Introduction to Dan Kiley Landscapes: The Poetry of Space (William Stout, 2009), "sadly, Kiley left us few written accounts of his approach to design." There are archives at Harvard, however they are far from complete. Ten days after his wife Anne died in 2005, Kiley's home/office in Charlotte, Vermont was struck by lightning and burned to the ground. In a recent conversation with Jane Amidon, Associate Dean for Graduate Programs and Research at Northeastern University, the Kiley collaborator noted, "When Kiley's office burned down, with it went thousands of slides and ideas he had taken from all over the world. Many slides had hand written notes scribbled on the edges. They were organized by location but also by key features that attracted his attention. When talking through his ideas for a new project, he'd pull out slides to illustrate the materials or effect he wanted." There do remain a small number of writings and interviews. In a 1982 lecture at the University of Virginia, Kiley stated: "the person who inspired me the most is Le Nôtre." Not only was that great seventeenth century garden designer Andre Le Nôtre, from whom we have Vaux-le-Vicomte, Parc de Sceaux, and his internationally famous masterpiece, Versailles, a constant source of inspiration for Kiley, as landscape historians Treib and Rainey have written, like Le Nôtre, Kiley's designs possess "strong geometry, clear axial organization, bold architectonic massing of plant materials, crisply articulated walls and terraces and interlocking spaces." Château de Vaux-le-Vicomte. Photograph © The Cultural Landscape Foundation. Knowing this about Kiley, I recently sought to retrace his footsteps by visiting Vaux, Versailles, Sceaux, Villandry and Chantilly curious to discover if Le Nôtre was as significant to Kiley as the great eighteenth century English landscape designer Humphry Repton was to Frederick Law Olmsted, Sr., the American who designed Central and Prospect Parks in New York, among many career highlights, and is considered the father of landscape architecture. What more could be learned about Le Nôtre's influence on Kiley? Parc de Sceaux. Photograph © The Cultural Landscape Foundation. During this quasi-pilgrimage there were a couple of notable discoveries. The Chateau of Villandry, the last of the great Renaissance chateaux built in the Loire Valley, was a site often mentioned by Kiley, his son Gus recently told me. 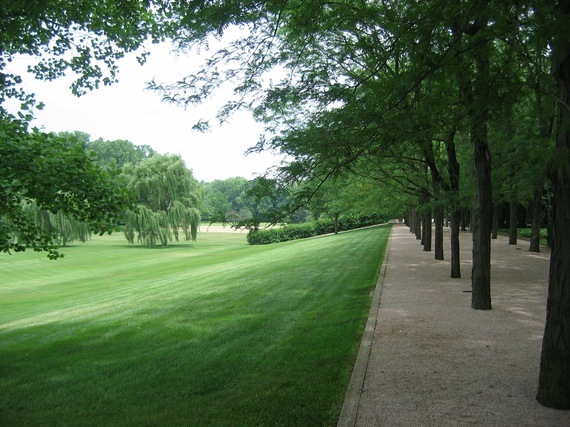 Gregg Bleam, a landscape architect practicing in Charlottesville, and a former Kiley employee noted: "Dan frequently referenced Villandry as an important garden, so I know that it was a project that inspired him." Villandry is famous for its absolutely astonishing and inarguably photogenic Ornamental Kitchen Garden; but to its south, there is the less photographed sunken Water Garden, with its central ornamental pond and lawn parterres. Château de Villandry. Photograph © The Cultural Landscape Foundation. Miller House and Garden. Photograph © The Cultural Landscape Foundation. "There's no question that the smooth, steep, angled slopes and tight allée that contain the back garden at Villandry relate to the Miller House honey locust allée. But there are clear differences too. At Villandry the allée and slope is a containment device while at Miller they create a multi-sided, spatially permeable threshold. At Villandry, the trunks mark the crest of the slope, while at Miller the allée is set back from the crest, allowing the upper garden, the slope and the lower lawn to function as three distinct elements. And subtle although all important, the character of the allées are quite different -- compare the dense, clipped canopy of Villandry to the airy, light catching foliage of the Miller House honey locusts. Despite these differences -- and in fact in concert with them -- the balustrade effect at the Miller House absolutely contains Villandry DNA." The Miller House absolutely contains Villandry DNA - that conclusion had me reeling with delight. My other "aha" moment came at Chantilly, a grand seventeenth century estate just a 30-minute train ride from Paris' Gare du Nord station and a place of great serenity and beauty. Le Nôtre's design includes circular water features and elegant canals that act as great mirrors that reflect the sky. Apparently, of all the gardens Le Nôtre created, Chantilly was among his favorites. 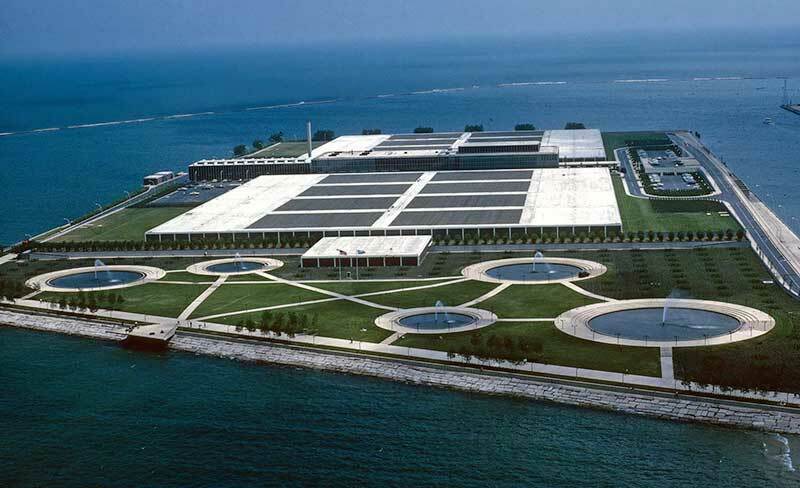 Surveying the landscape from an upper terrace, I immediately recognized in Chantilly the roots of Kiley's design for Chicago's Central District Filtration Plant, now known as Milton Lee Olive Park. Significant to the plant's design are five large circular pools with fountains -- one for each of the Great Lakes. Kiley described their siting as being, "not according to any circulation or structural concerns but an intuitive balance of poetic forms." John Beardsley, Director of Garden and Landscape Studies at Dumbarton Oaks and adjunct professor of landscape architecture at Harvard University, in his essay, Dan Kiley in Public (2009) noted: "we might recognize in them [the pools] an asymmetrical echo of Le Nôtre's water parterres." Look at the accompanying photos and judge for yourself. Château de Chantilly. Photograph © The Cultural Landscape Foundation. Milton Lee Olive Park. Photograph © Aaron Kiley, courtesy The Cultural Landscape Foundation. No doubt, there are many other discoveries waiting to be made about the link between these two great and enormously influential design geniuses. And as others go on that quasi-pilgrimage, keep in mind what Kiley himself said about the French formal garden in 1982: "this could be the most modern scene -- and Le Nôtre did it in the seventeenth century." Palace of Versailles. Photograph © The Cultural Landscape Foundation.